Presented in partnership with The University of Texas South Asia Institute and KUT-FM. This performance is made possible by a generous grant from The Andrew W. Mellon Foundation. 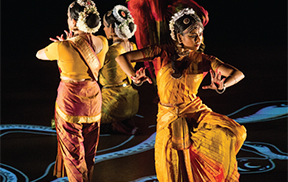 Minneapolis-based Ragamala Dance Company “is providing some of the most transcendent experiences that dance has to offer,” (The New York Times) and have created a genre of performance that brings together a contemporary Western aesthetic with an Indian ethos. Sharing the South Indian classical dance form of Bharatanatyam with audiences for over 25 years, Ragamala brings their multidisciplinary work Written in Water to the Bass Concert Hall stage. For tickets and more information, please visit the Bass Concert Hall's website.